Ever thought Skyward Sword’s Gratitude Crystals looked somewhat edible and delicious? 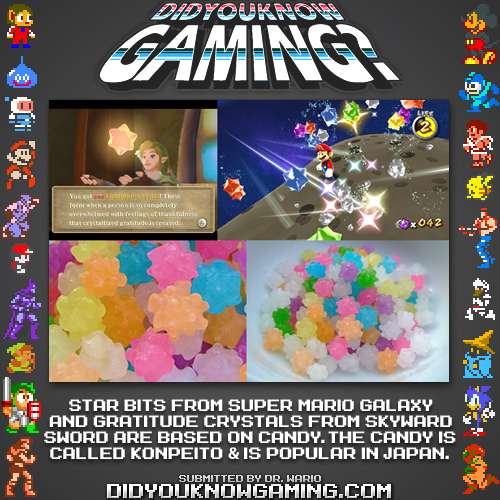 According to a recent Did You Know Gaming post, Gratitude Crystals are based off the popular Japanese candy called konpetio. Colorful and to many irresistible, this tasty candy was fortunate enough to be an item displayed in various forms of entertainment; from films to video games including both Skyward Sword and Super Mario Galaxy. Hit the jump to check out DYKG’s tidbit! Interestingly enough, the konpeito has a rather long history dating back to the 16th century when it was first introduced in Japan. To think this compellingly small piece of candy could be so popular amongst consumers yet alone be featured in video games as an item to be collected, konpeito is nonetheless more than “eye-candy” in games such as Zelda and Mario. Though various types of candy are commonly seen in numerous video games, I simply can’t help but crave the irresistible Japanese candy each time I see it as a Gratitude Crystal or Star Bit. Do any of you like the idea of candy being an item to collect in as they were in Skyward Sword or other games? Let us know what you think in the comments below!